Link: The unit was composed of New Zealand personnel. The Tiki, a Maori lucky neck ornament and the two hammers from the New Zealand Coat of Arms refer to this. Motto: Maori: Ake Ake Kia Kaha – For ever and ever be strong. History: Formed 1 October 1916 at Goldington. Disbanded Spilsby 15 October 1945. The Sqn No. 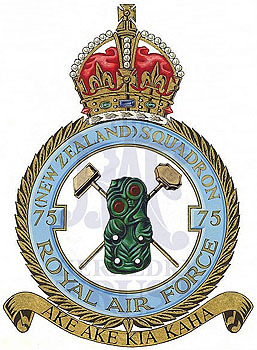 was perpetuated by its reformation as part of the RNZAF. NB. Finally disbanded on 13 December 2001 after completion of the artwork. Commissioned by the No 75 (New Zealand) Sqn Memorial Trust and dedicated to all who served 1916-1945.